Firefox Panorama is a new feature of the upcoming Firefox 4 browser which offers a new way of managing tabs in the browser. Among the features it offers are options to group tabs, display all open tabs on one screen and to only display selected tab sets in the browser's tabbar. Tab Sugar is basically a port of the Firefox feature to Google Chrome. It is still in alpha development according to the developer, but for that it offers an impressive set of features. The extension adds a new button to the Chrome address bar, a click on the button opens the overview page that displays thumbnails of all open websites in the browser. The size of thumbnails can be increased or decreased by resizing the area they are displayed in. Probably the most interesting option is the creation of new groups by dragging and dropping tabs around. The new layout is saved immediately after each action. 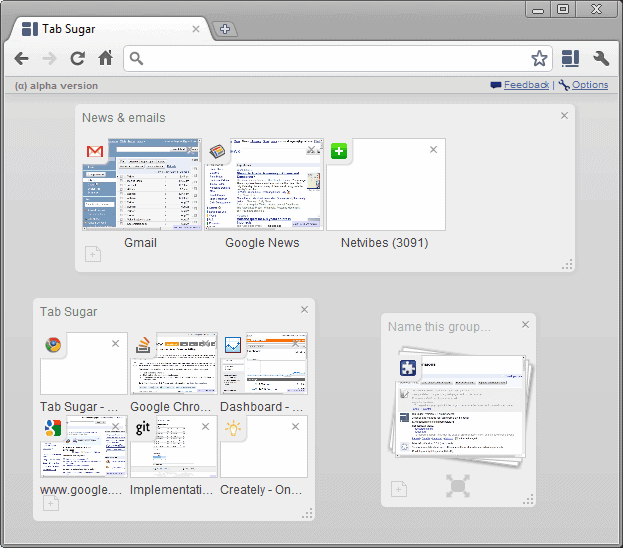 Now, Tab Sugar works different than Firefox Panorama in some aspects. Tabs that are moved into groups are not removed from the current tabbar which means that all tabs are always displayed in it just like before. There is also one core group that is the active group for that window. Other tab groups are automatically opened in new windows, which is a huge difference to the way Firefox handles it. This reduces the functionality of the extension quite a bit, unless users are used to work with multiple Chrome browser windows at the same time. The extension had sometimes troubles displaying the saved tab groups on the next restart of the web browser. This may be attributed to the Chrome Dev version this was tested on, but made the extension barely usable on the other hand. Chrome users who want to give it a try can download the extension from the official Chrome extension repository. It may however be a better idea to wait for a while until the extension matures and a stable version of it is released. Update: The extension has last been updated in 2011 and never left alpha status unfortunately. This means that it is not really recommended to install and use it as it is still not stable enough for use outside of test environments. It is an interesting concept but since it appears to have been abandoned by its author, it is nothing more than that. A comparable extension is not available for Chrome, unfortunately. Um, I can name a few dozen things that are worse, starting off with BURNING TO DEATH. Nothing worse in the context of the extension obviously..